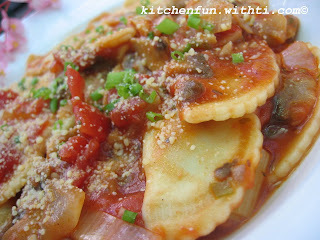 Golden, half-moon shaped egg pasta pillows filled with spinach and creamy fresh ricotta cheese. This is a delicious combination of flavours rounded off with a tasty mix of parmesan and ricotta cheeses. Cook onion and garlic for 5 minutes, stirring, until soft. Add mushroom, cook for another 1 minutes. 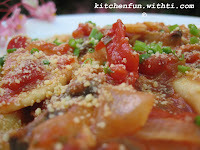 Add tomato and oregano, simmer, stirring occasionally, for 7 minutes. Meanwhile, cook Agnolotti in a large saucepan of boiling, salted water according to packet directions. Drain. 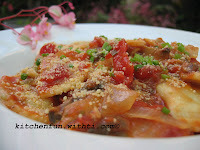 Top Agnolotti with Mushroom & Tomato sauce, sprinkle with Chopped chives and parmesan, serve.